The late August correction hit TMT leaders hard, partially overshadowing 2Q15 numbers that evidenced the technology driven paradigm shifts that are transforming sectors across the economy and concentrating value toward TMT early movers with the necessary skills, assets, and scale to take advantage. Key themes: 1) Pay TV audience losses and flagging ad sales, NFLX’s subscriber growth, and strong ad sales at GOOG, FB and TWTR are all effects of the shift from linear TV to on-demand streaming and digital advertising. 2) AMZN and MSFT’s extraordinary cloud growth, the ongoing success of SaaS apps (e.g. 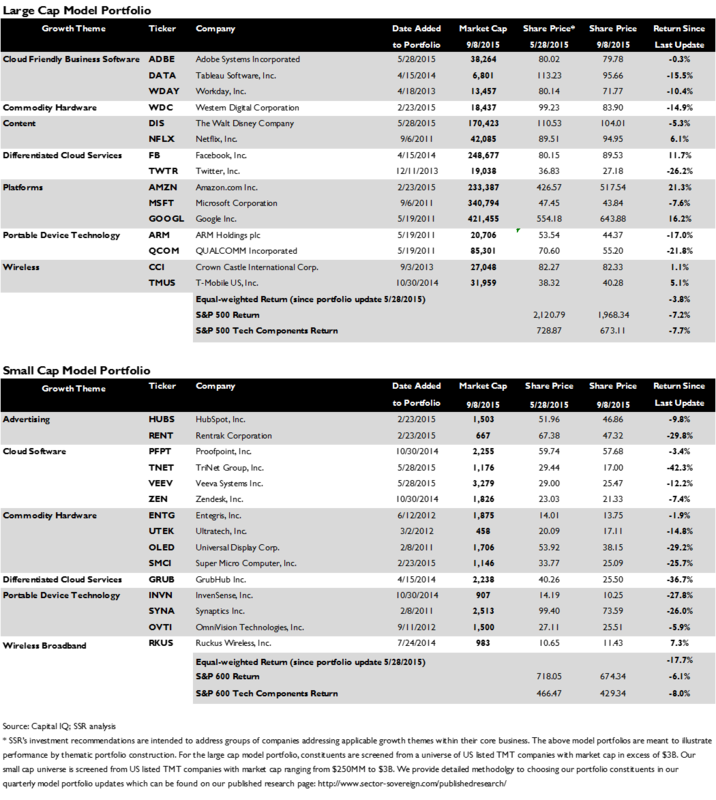 CRM, WDAY, DATA), and weak data center spending (IBM, HPQ, EMC, ORCL, etc.) show the enterprise exodus to the cloud underway. 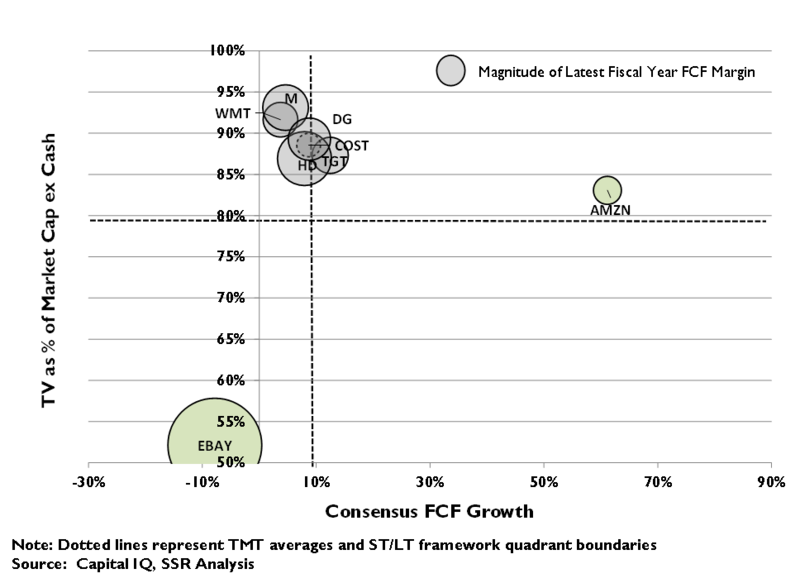 3) E-commerce continues to erode brick-and-mortar – AMZN reaccelerated its US sales, outgrowing top traditional merchants by a factor of 10, while EBAY executed its split with PYPL amidst swirls of hype around m-payments. 4) In devices, AAPL’s monster iPhone numbers decelerated as tough compares loomed and the Apple Watch turned out to have modest appeal – this hit both AAPL and its suppliers. Meanwhile, indigenous vendors Huawei and Xiaomi have reclaimed leadership in the Chinese smartphone market and seem poised to expend internationally. 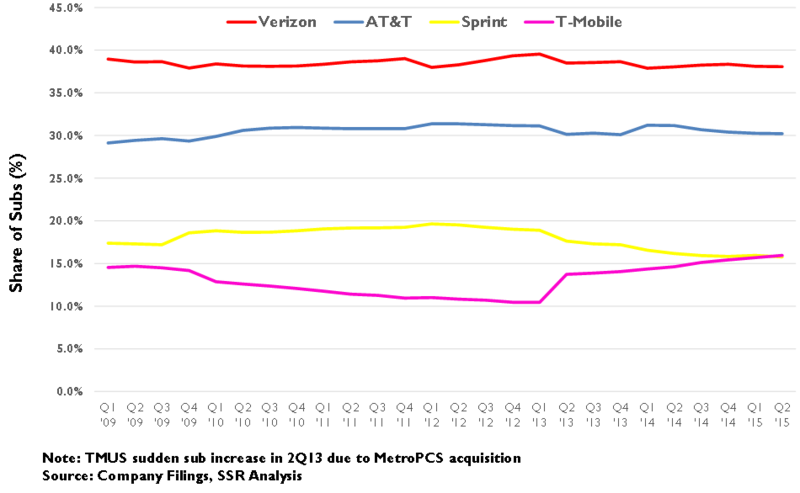 5) Finally, TMUS is delivering double digit sales growth, harvesting market share from its competitors VZ and T, which cannot match TMUS for fear of killing margins on its best customers, and S, which continues to struggle in execution. Conclusion: Generational sea change is a powerful force, and the companies driving it forward – GOOG, FB, AMZN, MSFT, and NFLX in particular – are positioned to prosper even in a worst-case economic scenario. High Multiple Does Not Necessarily Mean High Risk. The TMT sector is in the midst of a generational sea change that positions the leading innovators to concentrate value from traditional businesses across the entire economy. These companies, including the “FANGs” – FB, AMZN, NFLX, and GOOG – are perceived by some investors as part of a new tech bubble, leaving them to take a bigger than average hit from the recent market correction. Given the massive size of the opportunities that these companies target, the huge advantages that they gain from scale, skills and moving early, and the deflationary nature of their products and services, we believe these high flyers will prove MORE resilient to economic downturns than the rest of the economy. The War on TV. The deterioration of linear TV has been playing out for years (http://www.ssrllc.com/2013/06/june-12-2013-the-war-on-tv-the-attack-of-the-boxes/ The War on TV), but gloomy results and a few blunt comments from media executives finally shook investors from their torpor and media stocks from relative highs. Despite management happy talk minimizing long term implications, the trajectory is frightening and we see valuations as still optimistic. Meanwhile, NFLX is down nearly 20% from the correction, badly underperforming despite the previous enthusiasm over its strong 2Q15 sub growth. We are not nervous about possible new competitors, including AAPL, and see the current depressed price as a significant buying opportunity. With TV ad revenues decelerating into declines, GOOG, FB and TWTR all posted strong ad revenue growth. This is no coincidence, as ad buyers continue to grow more comfortable with online metrics even as they lose confidence in the reach, efficacy and value of TV. Enterprise Cloud Exodus. AWS 2Q15 sales up 80% YoY. MSFT cloud revenues up 98% vs. 2014. GOOG’s cloud is reportedly delivering 60% annual growth. CRM is growing 2x%. WDAY sales are up 47%. Meanwhile, HPQ sales are down –8.1%, IBM –13.4%, and ORCL -5.4%. Once favored EMC has decelerated to just 2% growth on an obvious trajectory toward declines. The same is true for CSCO, save for a bump in non-core businesses curiously coinciding with the CEO transition. 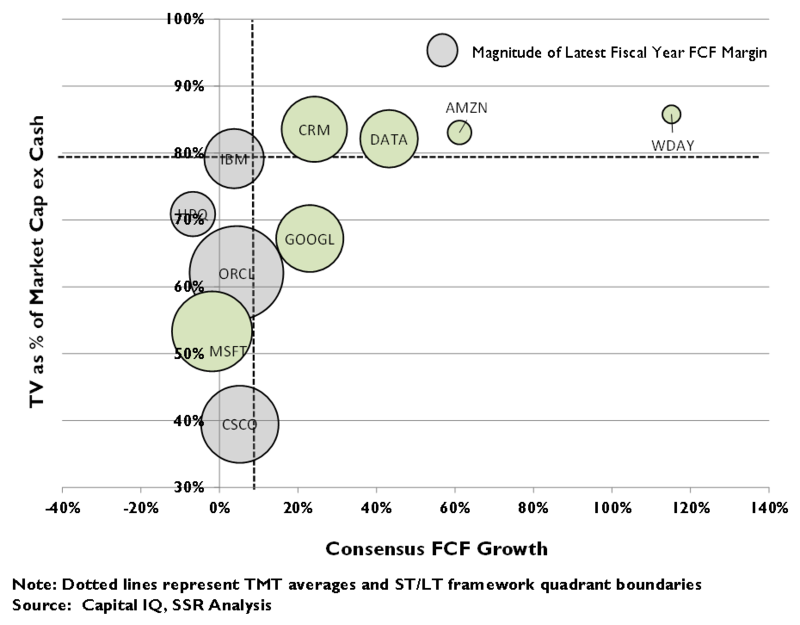 We see the large majority of traditional IT names as value traps, with the exception of MSFT. E-commerce is harder than it looks. For all of the talk of “click and mortar” and “omnichannel”, few traditional merchants have successfully turned the corner. AMZN turned up the heat in 2Q, accelerating to 26% growth in its primary e-tail segment. While the top 10 US retailers grew sales an average of 1.8% in 2Q15, US online sales are growing at an estimated 16% clip and AMZN is taking market share. Bellwether WMT saw its 2Q15 sales flat YoY with its multibillion dollar e-commerce initiative decelerating to just 15% growth and less than 13.7% of the sales volume of AMZN. We believe most retailers are seriously underestimating the obstacles to their digital success. Meanwhile, EBAY successfully spun out PYPL, freeing itself to fix its marketplace biz and spruce itself up for sale. 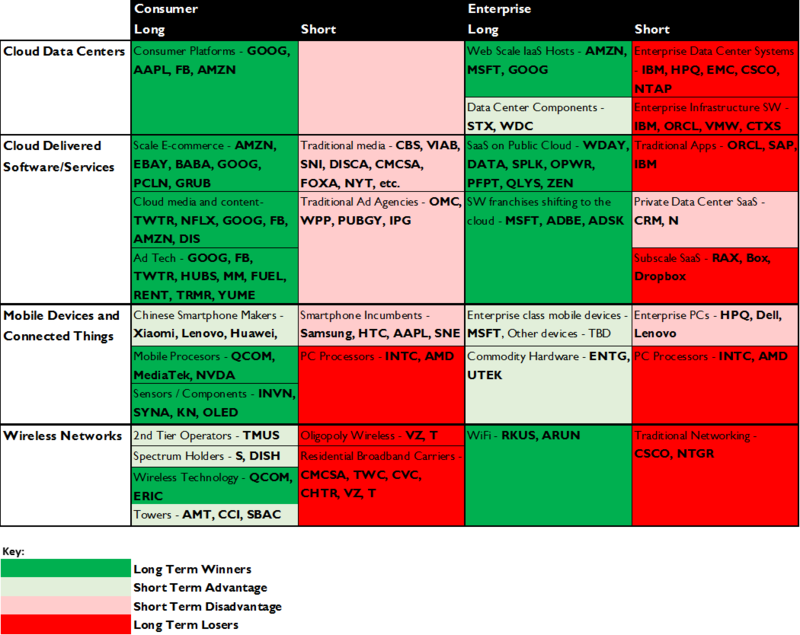 AAPL and the mother of all compares. The iPhone 6 temporarily juiced high end smartphone demand, drawing a lot of upgrade demand forward while also winning share with consumers with a preference for bigger screens. CEO Tim Cook’s Monday morning email to Jim Cramer stopped the rout in AAPL shares, attesting to continued strong sales in China during July and August, but the big risk is obviously still ahead of it. Meanwhile, Huawei and Xiaomi jumped ahead of AAPL in China and have significant ambitions outside the home market. We expect Chinese brands to take considerable global smartphone share going forward. TMUS harvesting subs from below. TMUS delivered 11% growth in wireless sales for 2Q15. All other.US carriers posted declines, as TMUS’s low prices and subscriber friendly “Uncarrier” initiatives allowed it to grab post-paid subscribers while market leaders VZ and T held the line to protect ARPUs and margins. We expect this dynamic to continue to play out to TMUS benefit, with S too encumbered with its crazy quilt network and ongoing poor execution to play spoiler. Staying the Course. Our large cap model portfolio continues to outperform, topping the TMT elements of the S&P500 by 381 bp over the past 3 months. Amongst the portfolio constituents are the companies that we believe that are best positioned to dominate the future post-sea-change landscape – GOOG, FB, AMZN, NFLX, MSFT, TMUS, QCOM, and ARM. DATA, WDAY, ADBE and TWTR are unique cloud franchises, well positioned going forward. DIS, WDC and CCI are not necessarily advantaged by paradigm change, but have near term tailwinds that support their inclusion in the portfolio. We note that our change themed small cap model portfolio has performed very poorly, we believe owing to the concentration of value in those themes toward scale players. Given this, we intend to adjust our strategy to a more value oriented approach with our next update. The August correction hit TMT particularly hard on the downturn. Our large cap model portfolio, heavy with high multiple growth leaders, dropped 12.4% from August 17 to 25, underperforming the broader market by 20 bp. Of course, these same stocks led the bounce back, and our portfolio ended up beating the tech components of the S&P 500 by a healthy 381 bp over the past 3 months. Moreover, 2Q15 earnings offered potent evidence of the long-term change vectors that we use to guide our stock selections. Despite perturbations in the broader market and global systemic risks, we believe that these irreversible trends will allow these scale advantaged innovators to continue consolidating value from across the economy. Nowhere was paradigm change more evident than the media sector – NFLX’s sub growth triumph was a stark contrast to the eroding linear TV business model. Add in GOOG, FB and even TWTR’s strong digital ad spending growth, and the implications of falling viewers, weakening revenue streams and higher content costs for traditional media companies are apparent. While executives engaged in spin control, investors have taken their share prices down 25% from June highs. We believe this is just the first leg down. N.B. We consider the beat down recently administered to NFLX shares as a considerable buying opportunity. Likewise, enterprise IT spending has begun to shift to the cloud in earnest. Portfolio components AMZN, MSFT, GOOG, ADBE, WDAY and DATA all posted spectacular double digit growth for their cloud delivered services, while traditional data center technologies either posted tepid, decelerating growth (networking, storage) or clear declines (servers, packaged software licenses). 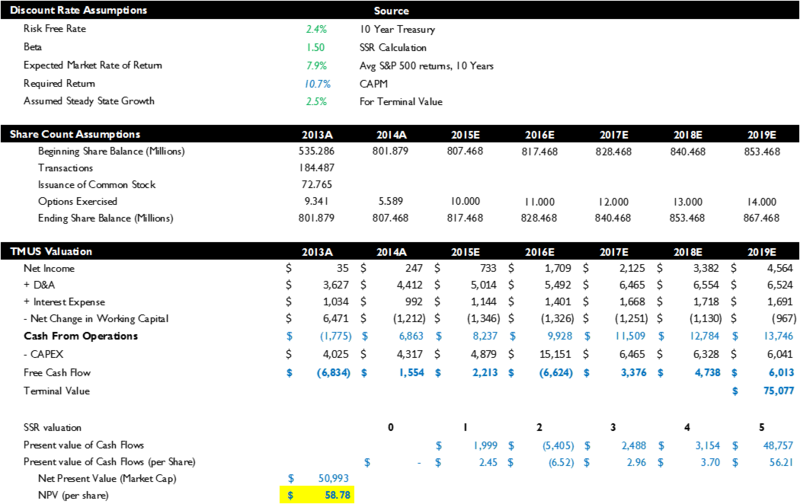 This is not going to get better for the likes of IBM, HPQ, EMC, NTAP, CSCO, ORCL, SAP and others. The same dynamic is playing out in retail, where AMZN’s e-commerce growth reaccelerated in 2Q15 while most brick-and-mortar merchants disappointed. Retailers are selling hope to investors in the form of “click-and-mortar omni-channel” strategies, but most are very late to the online game and lack the IT chops needed to make it work. AAPL’s luxury smartphone franchise slowed up a bit as much lower priced Chinese brands picked up some steam and investors peeked ahead to the massive holiday season compare. Without a big new product breakout (and Apple Watch doesn’t seem to fit the bill), maturation of the high end smartphone market looms with the threat of low to no growth. It could be even worse for the duopoly leading US wireless services, as VZ and T hold the line on prices and policy to protect ARPUs and cash flow while upstart TMUS harvests their subscriber bases from below. We think that the Uncarrier strategy will be keep paying off in sales growth and margin leverage for the foreseeable future. History suggests that paradigm change on the TMT landscape is generational and comprehensive. Like it did 25 years ago, innovation is laying waste to traditional market sectors and big companies, while opening huge opportunities to the early movers who have built the scale, skills, assets and cultures needed to drive these changes. With 2Q15 results strongly confirming paradigm change at work and strong performance YTD, we are maintaining the list of 15 stocks in our large cap model portfolio. DIS, with its exposure to linear TV, was a close decision, but we prefer to stay involved with the Star Wars Christmas just a few months ahead. 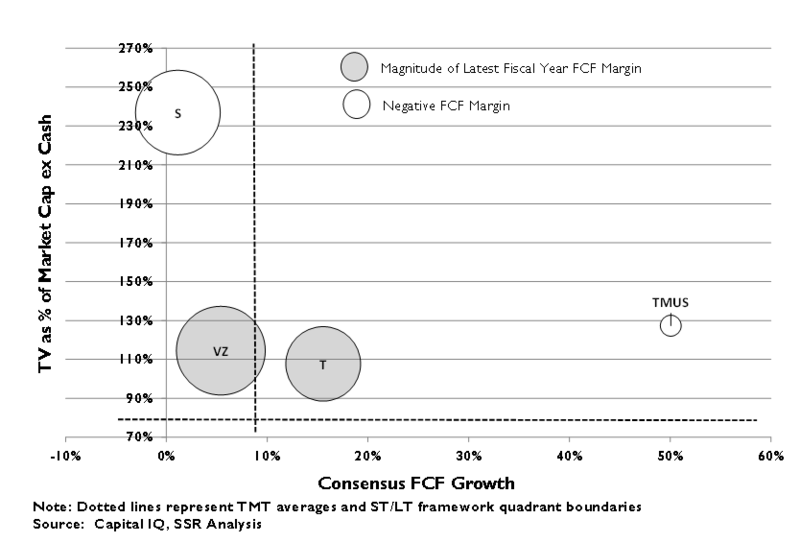 The thematic approach that works so well in large cap exposes our small cap portfolio to wrenching volatility, while cap limits and the propensity for the most interesting TMT innovators to remain private fatally constrain stock choices using this approach. We are re-examining our strategy and look to adopt a more value oriented approach to the small cap TMT portfolio at our next update. The East Hampton heliport was undoubtedly busy two weeks ago on Monday morning as the US markets plummeted in response to an overnight meltdown on the Chinese exchanges. Fear of a global contagion, and the hulking presence of algorithmic trading, drove the S&P 500 down as much 7% in morning trading before closing down 4% for the day and off almost 10% from the start of the previous trading week. Over the next two weeks, bobbed up and down and appears to be settling in somewhere between 7-9% down from the August 17 relative high. This head fake of a crash reveals some interesting nuggets of market psychology. From a TMT perspective, the most interesting, perhaps, was the beating taken by the so-called “FANGs” – CNBC shorthand for Facebook, Amazon, Netflix and Google – which had all thrilled investors with their strong 2Q15 results. All four companies fared worse than the broader market during the sell-off, despite their having little to no exposure to the Chinese economy. Netflix has not yet entered the Chinese streaming video market, and may not in the future, given well-entrenched indigenous competitors with privileged access to Chinese language content. Amazon’s disappointing Chinese initiatives have also been thwarted by Chinese rivals and should be an insignificant element of any company valuation. Google and Facebook have been directly blocked by the Chinese government. Even in the context of a China-catalyzed global recession, the high multiple stocks at the lead of the paradigm shifts playing out in TMT are not at particular risk. The underlying trends driving them forward expand value but reduce costs, a deflationary effect that should leave the stocks relatively recession resistant. During previous recessions – with the obvious exception of the 2001 internet bubble burst – tech companies on the right side of paradigm shifts have fared well. During the 1991 recession, Dell, Cisco, Oracle, and other avatars of the rise of client-server computing emerged as growth leaders, holding value during the crisis and leading the recovery. During the 2008-2010 economic crisis, high-multiple tech leaders like AMZN, GOOG, NFLX, AAPL, and EBAY crushed the S&P500 on sales growth, earnings growth and share price appreciation (Exhibit 3-4). We are also unconvinced that the high growth stocks in our large cap model portfolio are expensive. 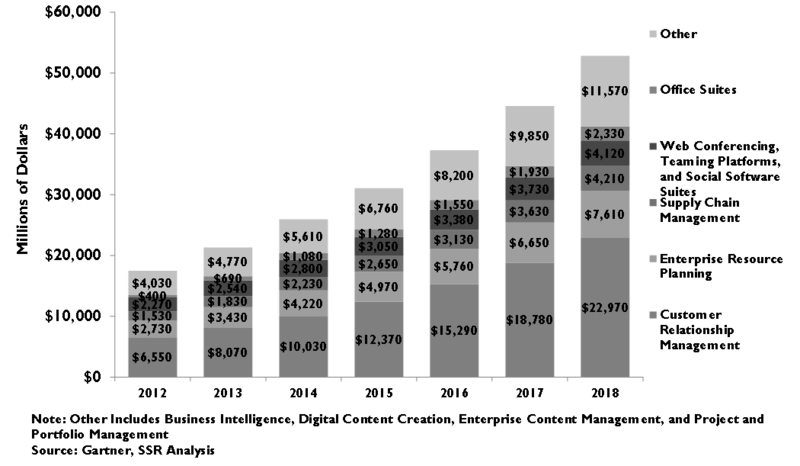 Not only are the opportunities available to Amazon, Facebook, Google, Microsoft, and Netflix massive, but the dramatic first mover advantage and scale economies characteristic of internet-based solutions are allowing them to concentrate the value being created into their own hands as they simultaneously generate leverage against the bottom line. These are stocks that can sustain growth longer than many suspect and that will grow far more profitable with time, even if some of them seem profit challenged today. In this context, last week’s correction is a TMT buying opportunity. Even with the bounce back, the implied 5th year terminal value of the stocks in our large cap model portfolio as a percentage of enterprise value is only 3.0% above the average for the entire S&P 500. For companies that are outgrowing the economy by a factor of 4-6x times, and that address tectonic shifts in huge swaths of the economy – e.g. advertising, retail commerce, telecommunications, media, enterprise IT, transportation, personal finance, health care, and other sectors – this is a small premium to pay. We have written extensively about the shift from linear Pay TV bundles to on-demand streaming video, (http://www.ssrllc.com/2015/08/august-12-2015-video-media-the-cord-cutting-myth-gets-real/, http://www.ssrllc.com/2015/02/february-3-2015-advertising-the-golden-age-of-tv-enters-its-golden-years/, http://www.ssrllc.com/2014/06/june-9-2014-tmt-the-advertising-revolution-will-not-be-televised/, http://www.ssrllc.com/2013/07/july-2-2013-the-war-on-tv-part-iii-reductio-ad-absurdum/, http://www.ssrllc.com/2012/07/online-video-objects-in-the-mirror-may-be-closer-than-they-appear/, http://www.ssrllc.com/2012/05/video-advertising-the-incredible-disappearing-audience/) an inevitable paradigm shift in home entertainment that is eroding traditional TV network brands and business models. Every year, more consumers are shifting more of their viewing time to streaming video delivered over the internet to a growing universe of smartphones, tablets, and connected TVs, attracted by inexpensive and compelling service offerings from Netflix, Amazon, and Hulu, as well as new standalone streaming products from Time Warner’s HBO and CBS’s Showtime. As recently as 2004, 7 different weekly shows drew average audiences of at least 20 million viewers, with American Idol reaching an estimated 30M Americans. Aside from Sunday night NFL telecasts, no regularly scheduled broadcast program has achieved that mark since the 2011-12 season. 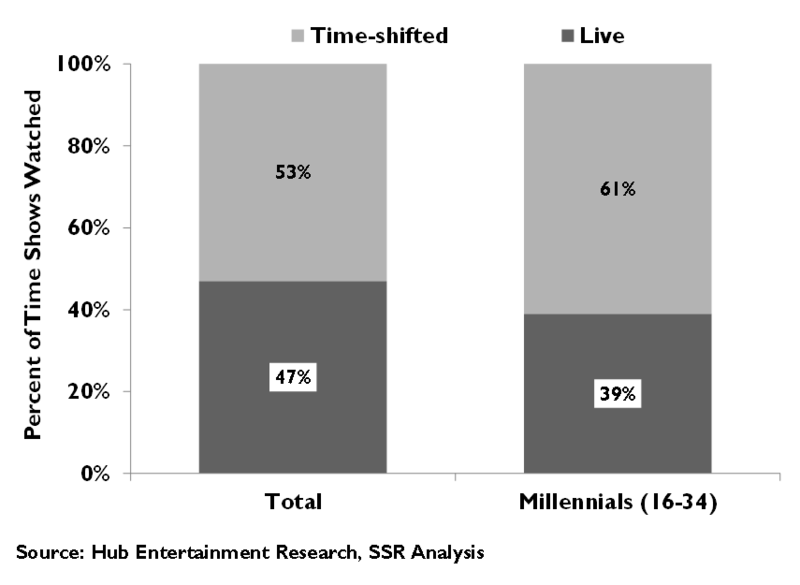 Even Nielsen, whose deeply flawed Peoplemeter Panel methodology, we believe, seriously overestimates TV viewing, began to report declining overall viewership in 2014 (Exhibit 6). Meanwhile, Digital Video Recorders (DVRs) have rendered live TV ratings meaningless as audiences are increasingly watching programs at their own convenience and skipping through commercials. Today over 53% of TV viewing is considered to be “time-shifted, with serious implications for the efficacy of advertising attached to it. Add in that even the live audience, often watching with a mobile device in hand, may be more distracted from TV advertising and the trends are grim. 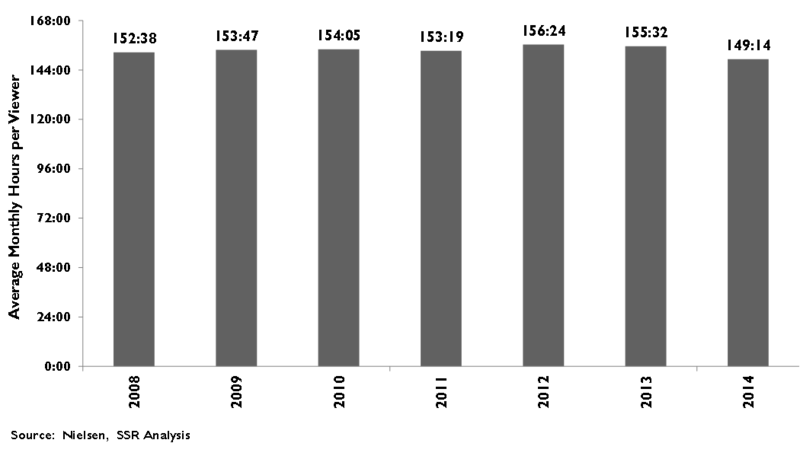 Networks have responded to lower ratings by stuffing more commercial time into each hour of content, from 13 minutes and 25 seconds per hour in 2009 to 14:15 today (Exhibits 7-8). They have also pushed hard to raise ad prices but advertisers have begun to push back. Ad commitments from the 2015-16 TV Upfronts were down 5-8% overall YoY according to Ad Age, as the contentious agency negotiations dragged out until late July and early August, weeks later than usual. NBC was quick to trumpet that its upfront dollar volume was up 2% to just under $6B, but included a 50% hike for on-demand digital ads and commitments for the summer Olympics and expanded NFL broadcasts. Given this, it is very likely that non-sports linear broadcasts experienced a decline. CBS’ Moonves said that the company was able wrangle a mid-single digit CPM increase, but with lower commitments. Disney hasn’t commented on its commitments, noting only a CPM increase – its tepid forward guidance suggests that volumes are likely down. Variety reports that ratings laggard Fox made fewer deals on flat CPMs, coming close to selling the same 75-80% of inventory as last year. Most cable networks have yet to provide details of their upfronts deals, but if Ad Age’s estimates are correct, they likely took a bigger hit than the broadcast nets. Meanwhile, the fees earned from cable, satellite and telco distributers are also under pressure. Pay TV prices have risen at an 8.1% average annual pace since 2000, with the MSOs willing to take higher fee demands from networks and pass them on to consumers (Exhibit 9). This gravy train appears to be coming to an end. Pay TV subscriptions peaked in 1Q 2012, as consumers began “cutting the cord” in favor of much cheaper “over-the-top” options. The trickle of subscriber losses accelerated into a stream in 2Q15, down almost 1% YoY. Bullish media analysts were quick to assume a linear trajectory of future declines, but a far harsher geometric acceleration seems much more likely, given the long history of technology adoption curves. After years of denial, all of this came to a head in early August when media stocks reported June quarter earnings. On August 4, DIS CEO Bob Iger set off a meltdown of media stocks with some commentary that the company’s crown jewel ESPN network has experienced modest subscriber losses and declining ad revenue. 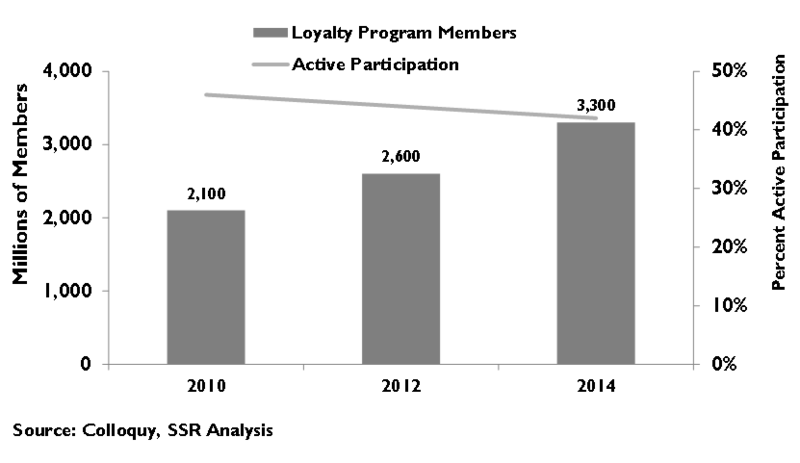 The next day – a Black Wednesday for US media stocks – DIS, CBS, FOX, TWX, CMCSA, VIA, DISCA, and SNI dropped an average of 7.6% and weren’t helped by commentary from CBS CEO Les Moonves during that company’s earnings call that it saw lower Upfront commitment volumes despite selling inventory for its February 2016 Super Bowl broadcast. That same evening, the next generation of Murdochs at the helm of FOX since July, announced 14% lower TV ad revenue despite airing some high profile events like the US Open and Women’s World Cup. By Friday’s close, the big 8 media companies had shed a collective $54.3B in market cap and ended August losing $94.3B (Exhibit 10). In contrast, streaming video and digital advertising leaders had a banner quarter. Netflix surprised to the upside on its sub numbers, up 30% YoY, with viewership numbers that would make it the most watched network in America – if it were a network. Google’s YouTube revealed similarly spectacular numbers – 10B hours of monthly viewing, 100% rise in mobile ad revenues, and 60% growth in videos viewed. Meanwhile, Google, Facebook and Twitter all posted big ad revenue growth, as digital – and particularly mobile digital – ads siphoned spending away from TV. Looking at media, MSO and digital media stocks within our short term-long term valuation framework is instructive, given the context. Media stock prices, despite their 15.8% August drop, imply 5th year terminal values that make up 91% of their enterprise value (Exhibit 11). This is well above average for the TMT universe and an indication of investor confidence in the companies’ positioning for the future. CBS, Time Warner and Disney all remain in the Dream Stocks quadrant where both 5 year cash flow growth expectations and the implied terminal value percentage are above average. Analysts believe Fox will deliver above average cash flow growth over the next 5 years, but investors have pulled the implied terminal value just a tad below average levels, putting in the Skepticism quadrant. The remaining media names are in the Comeback Kids sector, where even tepid short term growth projections haven’t entirely damped investor enthusiasm. We see this as much, much too optimistic. 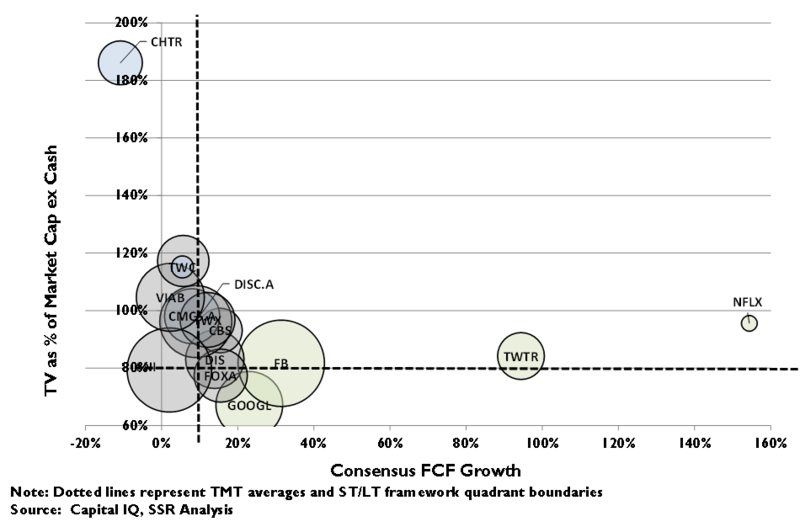 Meanwhile, the long term expectations for the new media stocks – Netflix, Google, Facebook and Twitter – sit well below the median for 9 media stocks, with just Scripps and Fox sporting implied terminal values at a percentage of total EV that are less than Facebook, the highest flying internet name. 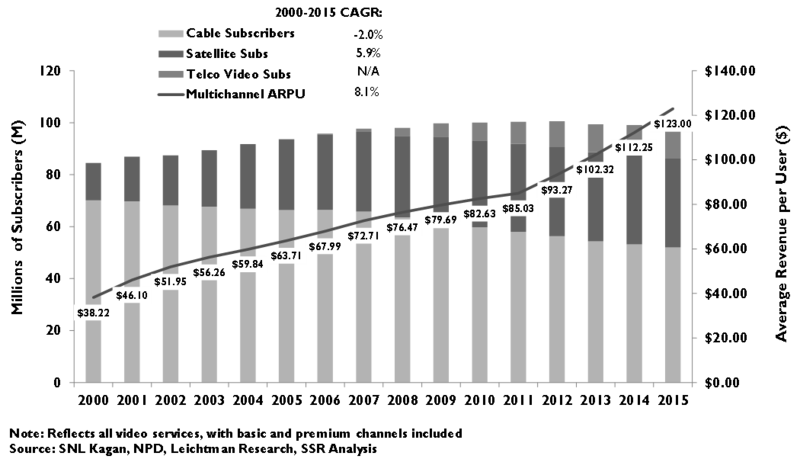 Annual global spending on data centers – hardware, infrastructure software, staffing, facilities, etc. amounts to more than $1.2T annually. We expect most of this will migrate to the cloud over the next 2 decades (see http://www.ssrllc.com/wp-content/uploads//ftr/15.05.15-SaaS-Eating-the-World.pdf), and 2Q15 results contained strong indicators that this paradigm shift to Software-as-a-Service (SaaS) applications and Infrastructure-as-a-Service public data centers is well under way. The compelling economic advantages of distributed data centers have fueled substantial growth in cloud revenues for the early movers with massive consumer franchises to drive scale advantages. AMZN’s AWS unit grew sales 80% YoY in its latest quarter and MSFT delivered annual cloud revenues up 98% over its FY14. Google, the other major web-scale data center operator, has not disclosed its enterprise cloud results but likely also saw similar growth. The big 3 cloud operators: AMZN, GOOG and MSFT are playing for leadership in a business that we believe will subsume more than $1T in enterprise data center spending over the next 10-15 years. Meanwhile, long established traditional market leaders with aspirations to the cloud future are falling behind, and lack the cost and performance needed to play catchup. We believe that Amazon, Microsoft and Google each have the potential to build their cloud operations into businesses with tens of billions of annual revenues by the end of the decade. Still, investors remain a bit cautious, particularly for numbers 2 and 3 (Exhibit 12). Amazon rallied strongly out of earnings, and retained nearly half of its gains after the market correction, cementing its position as a Dream Stock in our short term/long term valuation framework. Google has convinced analysts, who project strong 5 year cash flows for the company, but investors are less convinced, leaving it in the Skepticism quadrant. Microsoft is a Death Watch stock, an ignominious honor that we believe is entirely unjustified for a company so well positioned to prosper from the paradigm shift to the enterprise cloud. Microsoft has its Azure IaaS platform, its Office 365 franchise, its Dynamics SaaS ERP, and relationships with nearly every IT organization in the world. Still, it sits next to broken long term stories like ORCL, CSCO, EMC and HPQ, and below Comeback Kid IBM, which still has believers willing to grant it a premium terminal value. In the SaaS application market, our large cap portfolio picks delivered scorching sales growth in 2Q15 – Tableau was up 65.2% and Workday was up 51.3%, both in the face of a stiff FX headwind. Salesforce, no longer in our model portfolio due to its reliance on old architecture infrastructure, also delivered sales upside with 24% growth. Meanwhile, traditional Enterprise IT stalwarts with a health mix of traditional software revenue HPQ, IBM, and ORCL saw sales down -8.1%, -13.4%, and -5.4% respectively. 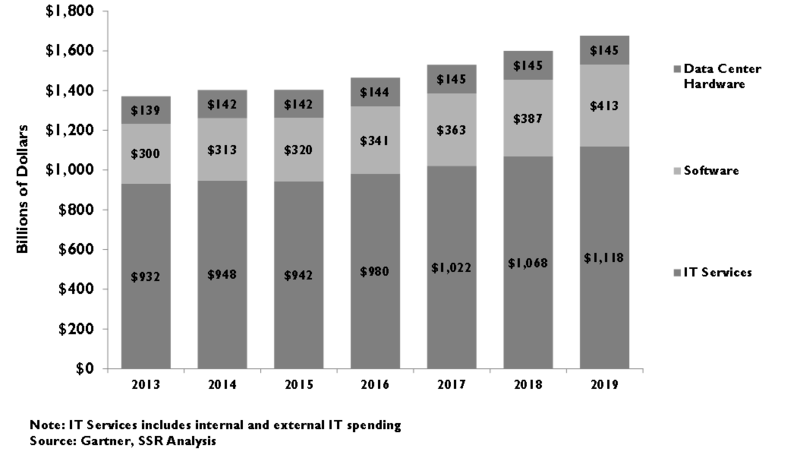 As with IaaS offerings, SaaS applications are also poised to displace spending on traditional IT by bundling data center costs into subscription fees, SaaS actually addresses the $1.1T spent annually on enterprise data center software, hardware AND services, with further savings in customer IT personnel as well (Exhibit 13). Gartner is expecting 20% forward growth in SaaS apps, a forecast that we believe may be conservative, given the growing rivalry fueled by falling IaaS prices (Exhibit 14). SaaS applications displace more than just packaged software applications, they also displace the hardware, infrastructure/platform software, communications services, and IT personnel necessary to deliver and support the application from the customer’s internal data centers. These elements are provided in a bundle with the application, and thus, winning long term SaaS solutions must succeed on both application functionality and data center cost/performance. This greatly increases the spending pool addressed by SaaS, and, until recently, has been a key competitive barrier for SaaS pioneers who have invested heavily in their own data center infrastructure. Brick-and-mortar retailers want you to know that they are not afraid of Amazon. Rather, they have asserted that a hybrid approach, termed the “omni-channel” or “click-and-mortar”, could combine the efficiency, convenience and choice of on-line shopping with the immediacy, experience and service of a real store. At the core of this would be an electronic loyalty program that would follow customers from the internet to the store and back, to facilitate shopping and buying at the consumer’s convenience, and tying it to targeted marketing on one end and sophisticated logistics on the other. As a part of this, 60 of the nation’s largest retail chains have banded together in the MCX consortium to create a mobile payments service able to steer customers from high-fee credit card transactions and safe from the prying eyes of outside organizations looking to exploit sales data. It all sounds good on paper, but in the end, the devil is in the details. As we have written (http://www.ssrllc.com/wp-content/uploads//ftr/15.06.19-Mobile-Payments-TMT-Perspective.pdf, http://www.ssrllc.com/wp-content/uploads//ftr/15.04.15-AAPL-GOOGL-Commerce.pdf), success in mobile commerce will be very, very difficult to achieve for most traditional merchants. Few have seen success with their card-based loyalty programs, and on the smartphone, they will face the cold realities of all 3rd party apps – few are downloaded, most of those are abandoned, and only a couple of handfuls of non-default apps are regularly used (Exhibit 15-16). There is just one Starbucks. Without strong existing customer loyalty, high visit frequency, and world-class IT and app design skills, we believe most would-be omni-channel leaders will find themselves sadly short of the well-integrated in-store/on-line ideal to which they aspire. This showed in 2Q15. Exhibit A? Amazon posted 26% growth in its primary e-commerce segment, accelerating sharply despite a fierce FX headwind. Exhibit B? The top 10 public retailers saw sales grow only 1.8% collectively in the same quarter. WalMart, the driving force behind MCX and a confident believer in its own omni-channel prowess, delivered a disappointing 0% sales growth and decelerated to just 16% growth in its much touted on-line business. The contrast with Amazon is stark, and should be troubling to brick-and-mortar retail executives. On a valuation basis, Amazon is a Dream Stock, particularly above the mean on expected 5 year cash flow growth with strong long term expectations as well. In contrast, one time high flyer Ebay sits in the Death Watch quadrant, carrying expectations for declining cash flow over the next 5 years and a profoundly pessimistic implied terminal value (Exhibit 17). We think that the opportunity is considerably brighter than that, particularly given the possibility of acquisition – Google and Alibaba would be synergistic buyers. Meanwhile, the big traditional retailers are huddled into the Comeback Kids quadrant. Given the history of dramatic paradigm shifts and business failure in the retail sector, we believe that the market may be overconfident in the staying power of the current retail status quo. Apple got a spanking after its 3QFY15 results, which confirmed a sharp deceleration in iPhone sales growth and disappointing initial sales of the highly touted Apple Watch (Exhibit 18). 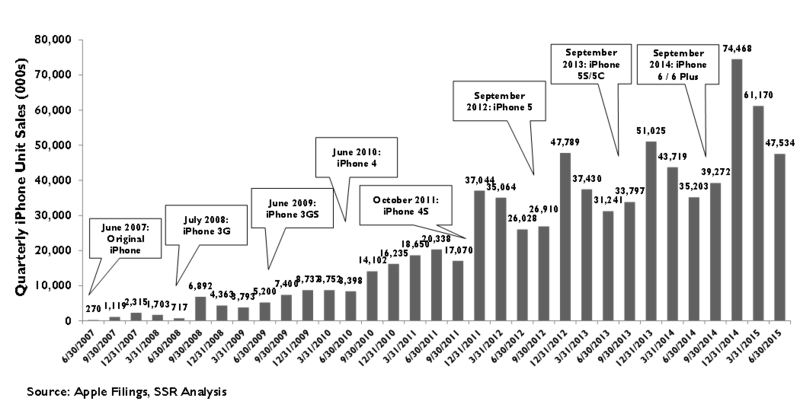 With an outrageous Christmas season compare coming and a relatively hum-drum iPhone update expected, investors are looking at a real possibility of a return to the single digit growth trajectory that plagued the stock in 2013. Our analysis suggests that the big iPhone 6/6 Plus sales have included an unusually high level of early upgrades. AT&T has reported that roughly 9-10% of its customers upgraded their phones during the typical pre-2014 holiday quarter. Apple reported nearly 15% upgrades last year. CEO Tim Cook has worked hard to spin the story toward hard share gains rather than pulling future upgrades forward, but the proof will be in the pudding as the first YoY comparisons for the expected iPhone 6S begin rolling in at the end of this quarter. Meanwhile, Chinese smartphone brands Xiaomi and Huawei surged to the top two market share slots in their domestic market, relegating Apple to 3rd place and ending its 6-month leadership run. Huawei’s 48% growth was particularly impressive, giving it extraordinary momentum as it prepares an aggressive expansion into international markets (Exhibit 19). Upstart Vivo nearly quadrupled its sales YoY to take 5th place for Chinese smartphone sales in 2Q15, just behind Samsung, which continues to bleed market share. Add in Levono, which has a global presence with its successful Moto G and Moto X models, which pack unusual bang for the buck. We expect this dynamic to continue to play out going forward. The high-end segment of the smartphone market, having absorbed the iPhone 6 upgrade bubble, will return to its decelerating track to maturation. Meanwhile, low-end smartphone makers have years of double digit market growth ahead of them, as sub-$100 Android devices wash out the feature phone market and as phone ownership becomes realistic for an every larger swath of the world’s population. This would be a tough future for Apple, and a mixed bag for phone makers and suppliers who will have to take their growth from the more commoditized end of the market. While Apple looks very cheap in respect to analyst expectations, investors are showing little confidence that the company will achieve those expectations. In many ways, Qualcomm is in the same boat, mired in the Death Watch quadrant with one of the lowest implied terminal values in the TMT large cap universe. However, in Qualcomm’s case, the impact of two major, but idiosyncratic, factors – a Chinese antitrust investigation and a botched product cycle in its flagship smartphone chipset – has largely played out, leaving upside as the company recovers unpaid royalties and wins back OEM business with a new chipset design. Two months ago, we wrote a deep-dive piece on T-Mobile USA (http://www.ssrllc.com/wp-content/uploads//ftr/15.07.09-TMUS-Wireless-Ain%E2%80%99t-What-it-Used-to-Be.pdf), which highlighted the changing nature of wireless demand, the strong appeal of T-Mobile’s Uncarrier initiatives, and the diabolical game theory matrix that traps Verizon and AT&T in their strategic box. As a result, T-Mobile is free to harvest subscribers from below as ineffectual Sprint looks on in jealousy. 2Q15 saw this dynamic at work. 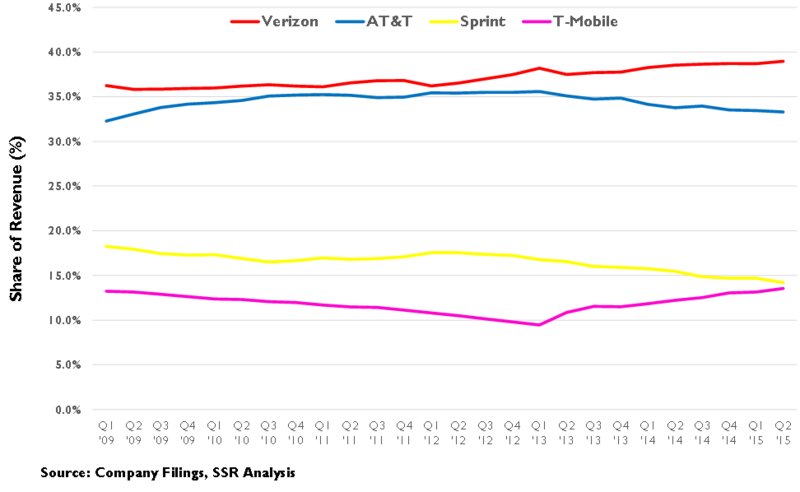 Verizon, AT&T and Sprint all saw ARPU erosion, weak post-paid phone subscriber numbers and declining wireless revenues. T-Mobile added 2.1M post-paid subscriptions and grew its wireless revenues by 11% (Exhibit 20-21). This is a classic Clay Christensen “Disruptive Innovation” case of an upstart attacking from the bottom and winning. We believe that there is considerable upside to TMUS based on ongoing share gains, scale driven margin expansion, and longer term new opportunities, such as “Internet of Things”, automotive, and residential broadband. We also believe that there are also substantial synergies available to potential acquirers. Of these, we see DISH as the obvious match, assuming that Charlie Ergen can raise sufficient cash to pay Deutsche Telekom for their share. With highly complementary spectrum assets, synergies with the satellite TV franchise, and an intriguing early play in OTT television, the combination could raise the value of TMUS by 37%. Analysts seem to recognize the strength of T-Mobile’s strategic position, projecting 70% annualized cash flow growth off of a very low current base. Still, our DCF suggests a $55-60 fair value for TMUS shares, a 40-50% upside over its current trading range, with a strong potential for acquisition at a further premium (Exhibit 22). Our large cap model portfolio beat the TMT elements of the S&P 500 by 381 bp over the past 3 months, but finished off -384 bp in absolute terms, owing to the market correction which shaved 820 bp in the last three weeks. Interestingly, our portfolio, which is strongly skewed to the high multiple stocks driving paradigm change, outperformed its benchmark during that downturn. Looking to the rest of the year, we are comfortable with our current stock selections. 2Q15 earnings added further validation for our broad thesis of paradigm change. We are maintaining FB, AMZN, NFLX, GOOG, TWTR, MSFT, ADBE, WDAY, DATA, TMUS and QCOM on that basis. 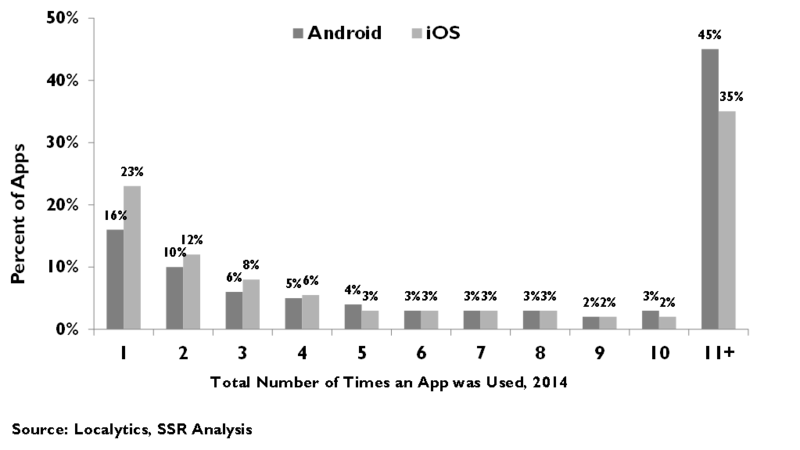 CCI remains a beneficiary of an expansion of 4G LTE coverage in the US, although we believe that the expanding demand for tower space will peak and begin to diminish before the end of the decade given new wireless equipment architectures on the way. WDC is poised to benefit from a turn in disk drive demand as cloud data center growth finally offsets PC declines. Finally, DIS is an odd fit for our portfolio given the exposure of its TV networks to the changing video landscape, but the time to replace it is not just in front of the release of the revitalized Star Wars franchise. We will keep it for now. On the small cap front, the story is completely reversed. With its thematic focus on stocks linked to our paradigm shift theses, performance has been wildly volatile and far too often, as was the case in this past quarter, extremely poor. In retrospect, we believe that force fitting a paradigm shift strategy on small cap stock selection was a mistake, as much of the value created by these themes is concentrated to first movers and scale players well outside of the cap range for the portfolio. Moreover, tech startups, which were once strongly motivated by investors to cash out in public markets as quickly as possible, now eschew IPOs for as long as possible, leaving very few worth early stage innovators available for small cap investors. After this quarter’s poor performance, down 974 bp vs. the TMT elements of the S&P600, we will reassess our portfolio strategy and look to shift its focus to a more value oriented approach. 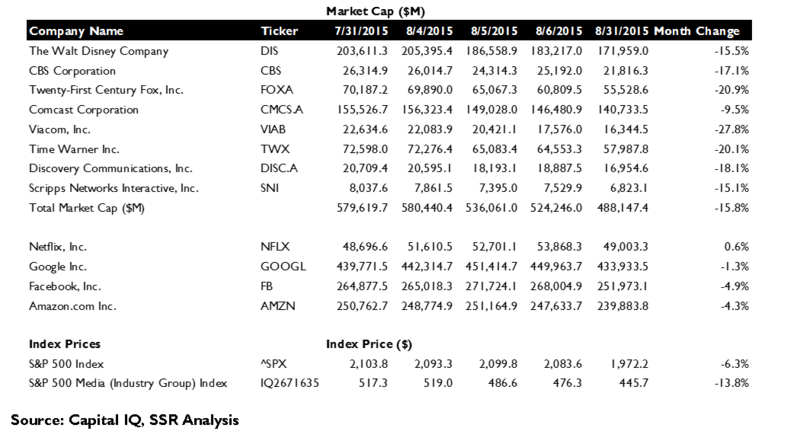 As such, we will leave the current stock selections in place for one more quarter.